Chair cane has many names such as hand cane and natural strand cane. Chair cane is the bark of the rattan palm and has been used for seat weaving for centuries. 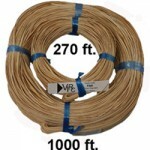 What size Chair Cane do you need for your chair cane project? Use the chart below to determine the size of chair cane needed for your chair caning project. Be sure that the holes in your seat are cleared and smooth with no sharp edges. Measure the size of the drilled holes in the chair seat frame. Then measure the distance between the holes in the chair seat frame. Measure this distance from the center of one hole to the center of the next hole. Binder Cane is approximately twice as wide as regular chair cane. 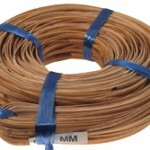 We sell 4 mm, 5 mm and 6 mm binder cane. 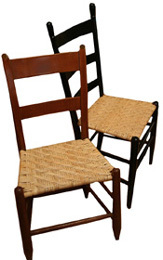 Binder cane is suitable as a sturdy seat weaving materials for woven seats on porch rockers (Kennedy rockers, etc. ), and other porch chairs. Binder cane has a shiny, durable bark side and a dull backside. 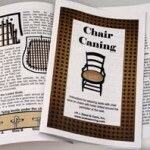 See our Seat Weaving Booklets page for instructions.